With all coated glass optimal elements for clear, crisp images and an erect image diagonal so that your views are correctly orientated, you will find that nothing come between you and a perfect view of the stars, with the smooth functioning altazimuth mount with easy pointing so you can easily locate items of interest and see all the great sights of the sky. Super fast and easy to set up with no tools required, the travelscope comes with its own preassembled aluminium full size photographic tripod to support the scope whilst in use and ensure a stable platform for a better viewing experience. 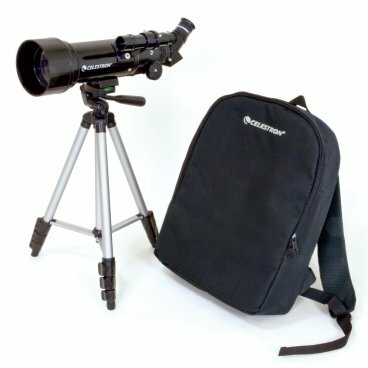 In addition, both telescope and tripod fit inside the handy custom backpack for convenient and easy travelling and storage so that you can take it with you wherever you go to view the skies from a whole new perspective. The Sky X  First Light Edition CD-ROM is also included with this product. A computerized sky map that features a 10,000 object database, 75 color images, horizontal projection, custom sky chart printing, and zoom capability. A fun, useful and educational product.